This page features living memorials for those that have passed from this world. 9th of Tishrei - Yahrtzeit - Howard Lee (Chaim Lee ben Yisrael) - Beloved and sorely missed by all his children. He was a lev tov and a truly generous and patient man. He was a man who could be relied upon, a man of his word, and accepted responsibility flawlessly. He established businesses that employed many and was upright in his dealings. Those of us who were close to him appreciated his goodness and positive attributes. 9th of Tishrei - Yahrtzeit - Emmanuel ben Moshe - Beloved and sorely missed by all the members of his family. He was truly a blessing to all of our lives. A loving, generous, soft spoken man yet strong with directional determination. We really wish Moshiach would get here already and resurrect the dearly departed so that we could spend time with Grandpa. 8th of Chesvan (3 November, 2003) - Yahrtzeit - Shmuel Dovid ben Herschel - Shmuel (51) lived in Los Angeles, California and was a gentle giant, one of the truly warm people of that city. He was hit by a car while riding his bicycle (his only means of transportation) a few weeks before the above date, and remained in a coma until his passing into the upper world. A holy brother to all who knew him as well as radiating a friendly light. We'll all miss you, Shmuel. Pray for this generation. 21st of Chesvan - Yahrtzeit - The Stanislaver Rebbe, Rabbi Israel Rosenbaum z"l - Blessed be his memory - The Stanislaver Rebbe was a true Ba'al Shem Tov Rebbe in our time. He was a Ba'al Simcha and a Ba'al Tefillah. His holiness was apparent to all and he taught by example. His beautiful, colorful and varied Bekishes (long coats) were a reflection of his heavenly personality. He lived through World War II in occupied Europe, later moved to the United States and established Congregation Tifereth Israel of the Stanislaver Rebbe in Monsey, New York. His soul always lived in Yerushalayim and he is buried now on Har HaZeitim (Mount of Olives). The Rebbe was instrumental in encouraging Avrahom Dovid to have the imagination to build ThirdTemple.com and related projects. Something amazing about the Rebbe, was that you could learn from him by osmosis (just from being in his presence). We look forward to his return upon the arrival of Moshiach and the Resurrection of the Dead. 21st of Kislev - Yahrtzeit - Nathan Kulish (Rafael Nosson Ben Zev) - Beloved, in memory of, by the family. 26th of Kislev - Yahrtzeit - Donald Seixas (Don Ben Avraham) - A sorely missed, beloved, easy-going, refined person. A wonderful husband and a good friend to all who knew him. 11th of Shevat - Yahrtzeit - Rabbi Noah Weinberg z"l - Blessed be his memory - Rabbi Weinberg was a true Noah in our time. He was a leader and a builder through example. He was an inspiration to countless numbers of people of all ages and mindsets. Having said the above, which is only the tip of the iceberg, he was also a monetary supporter and a strong, unwaivering promoter of the 7 Laws of Noah Education Outreach Project. Rabbi Weinberg always taught people to have appreciation for those people (parents and teachers, etc) who have helped you in life. He said know who you owe and act accordingly. Know what you know and don't waiver from that. One of his main teachings was, "life is about pleasure (a pleasure principle), Live it." 18th of Shevat - Yahrtzeit - Rava Ramstetter (Baruch Dayan HaEmes) - The world lost one of the most kind, gentle and giving man I have ever meet. Rava Ramstetter, husband of Rochel Ramstetter passed away on Shabbos. He suffered for many years and now his pain is gone. I am sure he is resting comfortably in Gan Eden. Death is always hardest on those left behind. May we all be comforted among the mourners of Zion and Jerusalem. 10th of Adar - Yahrtzeit - Rabbi Avraham ben Yehudah Tzvi Brandwein (Avraham ben Leah) z"l - Blessed be his memory - A holy, soft spoken Rebbe (the Stretin Rebbe) in the Old City of Yerushalyim. 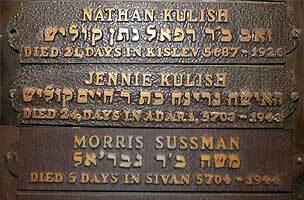 24th of Adar I - Yahrtzeit - Jennie Kulish - Beloved, in memory of, by the family. 8th of Adar II - Yahrtzeit - Asher ben Moshe (Asher ben Chaya Sarah) z"l - Blessed be his memory - A good friend and a great host to many people in the neighborhood of Nachlaot, in the Holy City of Yerushalayim. 5th of Sivan - Yahrtzeit - Morris Sussman - Beloved, in memory of, by the family. Beloved friend and comrade. Yohonathan was a true Moshiach-wannabe. His presence in the Old City of Jerusalem during the 1980's and 90's elevated and inspired many of us. We all miss you, Yohonathan. Come back soon. 24th of Sivan - Yahrtzeit - Chayim Baruch Yehudah ben Dovid Tzvi (Reb Chayim Yerushalyim) - Reb Chayim was a one-of-a-kind blessing to the world. Through his Shabbos meals (both with the Shabbos Awareness Center, and in his own home) he inspired Thousands of people to come closer to Hashem. His open heart, and open home, were a beacon for many more. His memory will live on through his stories and his students. We will never forget you, Reb Chayim! 9th of Av - Yahrtzeit - Pinchas Frieberg - Pinchas will be missed by all. He was a man with incredible optimism and energy. 14th of Av - Yahrtzeit - Reb David Hertzberg (Mayim Chaim David Hillel ben Schraga Fivel) - What can we possibly say?! What a loss to his family, friends, students, the Holy Wall (the Kotel), and to all of Clal Yisrael! The truth is Reb Dovid's full name says it all. We love you Reb Dovid. Come back soon. 7th of Elul - Yahrtzeit - Esther bat Gruna (Esther bat Raphael Nosson) z"l - Blessed be her memory - Beloved, missed, the greatest Grandmother. She was quiet but strong. Such a stable person, a real foundation. A great artist and everything and more than mere words can do justice. If for no other reason, other than to have her back in our presence, Moshiach should come now! 20th of Elul (11 September, 1998) - Yahrtzeit - Morris Franklin Seitz (Moshe ben Samuel) - Beloved husband, father and good friend. A word from Morris's friend: Morris was a brilliant, creative thinker as well as being incredibly original artistically. When he set his mind to something, he was so focused and there was no stopping him from completing his goals. We all would do well to learn from Morris's motivation to be original and his outstanding work ethic. This was a man who was strong but gentle, independant yet needed people. Albert and Florence - Beloved and missed by their family and friends. The world could learn about what a good marriage is from their example of oneness. Generous, hard working and caring people. Sarah Freidel - Beloved and missed by her family and friends.